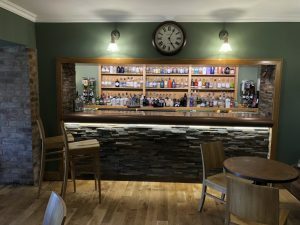 An Ayrshire hotel, Wildings is well known for modern cuisine taking advantage of the lush, clean countryside and clear seas to source the very best local ingredients, setting the standard for an out of town restaurant in a coastal setting. We are a family run Ayrshire restaurant, providing a close attention to detail across an exciting and wide choice of menus, that continuously adds exciting changes around dishes that have been chosen favourites for many years. Wildings feature a comfortable relaxed ambience with an outlook across Maidens Harbour to the Holy Isle and the Isle of Arran. We welcome families out for the day, enjoying the Ayrshire coastline and sophisticated evening diners. We are proud to offer our customers the freshest quality king and queen scallops, lobster and crabs which we source from our local harbour in Kirkcudbright. Our haddock is from sustainable waters off Shetland and our cod is caught in the waters off Iceland and the Barents Sea. We sell only fresh fish as we want our customers to enjoy the unique quality and flavour that comes from only the freshest of fish. Our chips are made from fresh potatoes that come from a local supplier. Polarbites is a family run business, our sister shop is Polarpak – a fresh fish shop which was established in 1985 and is situated directly next door. Customers always came in and asked if there was anywhere in Kirkcudbright to eat all of the fresh fish we sell and answer was always no, so we decided there was an opportunity to set up a business that allowed our customers to enjoy the taste of the delicious fish and in June 2007 Polarbites opened its doors for the first time and has never looked back. We are located next to the harbour square in the picturesque Artist’s Town of Kirkcudbright where you can enjoy your takeaway fish and chips strolling round or sitting at the harbour where fishing boats land their catches of mainly King and Queen Scallops. If you prefer to sit-in we have seating for 40. We are not licensed but you can bring your own wine or beer etc, there is no corkage charge and glasses are provided! Throughout the year a variety of entertainment is provided by Kirkcudbright Summer Festivities. This ranges from Scottish nights to classic car rallies, from historic walks to a medieval fayre. There is also an Annual Jazz Festival and a spectacular Tattoo is held every August. No visit to Kirkcudbright is complete without a visit to Polarbites for some award winning Fish and Chips!